Somebody moved Oklahoma and forgot to tell me! I think Oklahoma got moved further north without anyone knowing about it. It is snowing again! My front sidewalk still has snow and ice on the edges from the last 2 storms that rolled through. Now it is being covered up again with snow. This is not typical winter weather for this area. I’m dreading February, because that’s usually when the worst winter weather hits. I’m slowly progressing on the Chain Link socks. 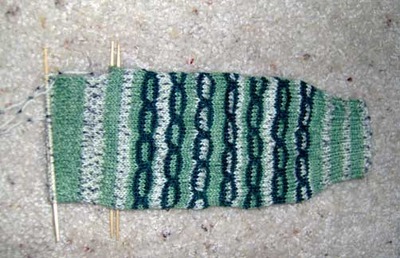 Finished the heel decreases and started down the foot. I broke one of my 5″ size 1 Brittany double point needles so had to switch to 6″ bamboo’s. The bamboo needles slow down my knitting because they are too long and get in the way. There is some good news about my b-i-l Don. Turns out not to be heart valve problems so he won’t need surgery. He is retaining fluid, especially around his heart, and they can control it with meds. His heart is just slowly breaking down due to the muscular dystrophy. He really has done well. Most people with his type of muscular dystrophy don’t live past their early 20’s, and he’s in his 50’s. At the commissary yesterday I found something new. Pringles Select Szechuan Barbecue Rice Crisps. The best snack item I’ve had in a long time. Do you think a tank of gas and 4 hours of your time is too much for an amazing pizza or calzone? When I got to Tulsa Fri. night, Steven & Jessica took me to Umberto’s. The Supreme Calzone was the best I’ve ever had. We also had an order of Garlic Knots (dough twisted in a knot with a buttery garlic sauce). If you order the garlic knots everyone in your group has to eat them, so no one is offended by garlic breath. If Tulsa were closer I could definitely see myself as an Umberto’s regular. Seems like I spent the whole weekend eating. I practically rolled home. We got up Sat. morning and Steven made French Toast and sausage. We all got ready and then went to Utica Square. Utica Square is like an open air mall or a collection of small strip malls. It has a very unique atmosphere. Of course while we were there I had to go to Loops. Loops has a wide yarn selection. The people working there were quick with a friendly welcome and to acquaint me with the layout of the store, even though the store was full of customers. Steven wants me to knit a hat for him, so he purchased some Rowan wool/cotton. I saw some Regia Silk and Panda Cotton that I couldn’t resist. So I now have yarn for 2 more pairs of socks. The Panda Cotton is a bamboo/cotton/elastic nylon blend. I liked the bright cheery colors. 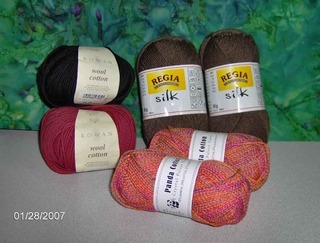 The Regia Silk is a wool/silk blend in a solid brown color. I’m going to use it for the next Six Sox Knitalong, because they suggest a yarn in a solid or mostly solid color to show off the pattern. 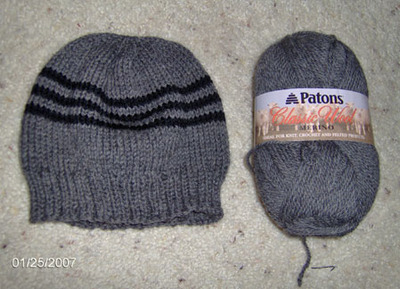 The Rowan wool/cotton is for Steven’s hat and he wants it to be red with black stripes. After the yarn shop experience we went to the Wild Fork for lunch. I had a Wild Caesar side salad (caesar with artichokes, olives, feta and parmesan). How could anything with artichokes, olives, and feta cheese not be good? Also had the Spicy Szechwan Stir Fry, it was good, but more like a teriyaki sauce and not spicy at all. We went back to the house to visit and play with Josie. Josie didn’t care much for my knitting, she thought I should pay attention to her. Then later Steven fixed steaks, baked potatoes, corn on the cob and ciabatta cheesy bread. Believe me, we weren’t starving but it didn’t stop us from cleaning our plates. I couldn’t get a good picture of Josie because she either wouldn’t look at the camera, or she stared right into the flash. Making her eyes that funny green. Every morning she woke me up by coming in and laying on my head. Sunday I left before noon and went through Okmulgee on the way home. Stopped by Kerry and Jason’s. I hadn’t seen their new house. It’s nice, lots of space. The grandkitties Shadow and Whiskey didn’t care much about me, but they sure liked my keys and totebag. And if I hadn’t eaten enough over the weekend already, we went out for chinese buffet. Now you know why I say I rolled home. I had a very nice weekend and it was good to visit with the kids. We don’t see them nearly as often as we would like. Came home to find out that my brother-in-law Don is in the hospital with heart problems. He’s having tests today and they think he has a weakened valve. Bill has gone to the hospital to see him and take him a few things. 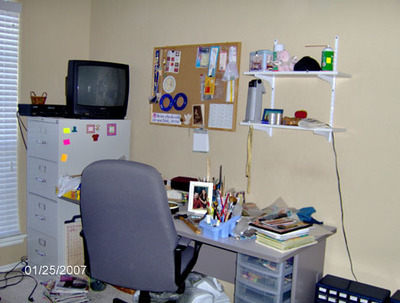 I decided to post pictures to prove that I really have been working on the sewing/craft room. Keep in mind that it’s still in the unpacking stages and a big mess. The grey countertop leaning against the wall is going to be my new cutting/worktable. It will be on wheels and have a shelf underneath. The table is 6ft long, but next to the big comfortable executive office chair it looks very small. I don’t have anything really interesting to post about. I’m still unpacking the sewing/craft room. I haven’t counted the number of boxes I’ve unpacked, but it’s been a lot. 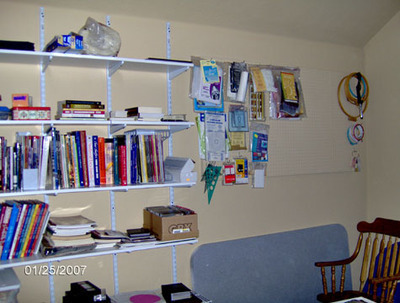 The guest room is still full of boxes labeled sewing room. I think they must multiply at night. I have been getting some knitting done in the evenings. Finished Jason’s “London Beanie”. And….. Finally got back to work on the Chain Link Socks. 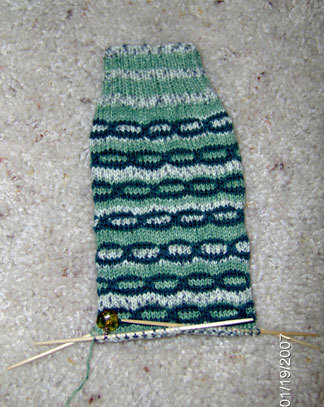 Knitted half of the heel flap last night. I’m knitting it in the Eye of Partridge pattern. It doesn’t show up well in the pic. This is probably my last post until Monday. 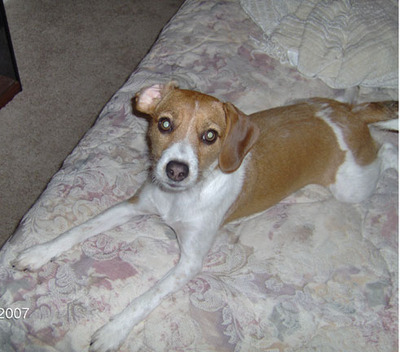 Tomorrow I’m going to Tulsa to visit with Steven, Jessica and Josie the Grandpup. I found out that where we’re going to lunch on Saturday, is by Loops. Maybe there will be some new yarn coming home with me. Sunday, on the way home, I’m going to stop in Okmulgee and visit with Kerry and Jason. I haven’t seen their new house. I realized that my prescriptions need to be refilled. So I have to drive to Ft. Sill today. This should be my last medically related trip down there. We are getting a new primary care Dr. here in OKC next week. I wanted to wait until this lung thing was pretty much taken care of. It’s so much easier to get referrals when you have one Dr. that’s been in on everything from the beginning. I may drop by Hancocks while I’m in Lawton and see who’s there. Then head back. I’m still unpacking and organizing the sewing/craft room. (Notice I added craft) It’s coming together, but can you believe I haven’t even started on the fabric yet? Have a long way to go before the room is ready for producing any projects. When I start organizing the fabric I want to cut strips for the “Strip Swap” at the same time. 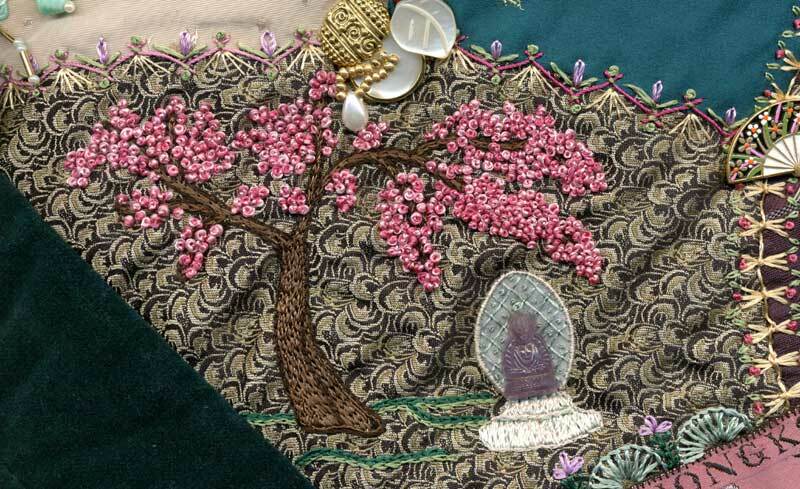 The Skrappy Ladies (my quilt group) are doing Strip/String quilts at our spring retreat in April. The majority of us are making scrap quilts, so everyone is bringing precut strips to swap. I had to start over on knitting Jason’s hat. I made a mistake while trying to do the jogless stripe and was frogging back to start over. I pulled on the wrong piece of yarn and suddenly had a big mess. Since it’s such a fast and easy knit I just decided to start over. Now I’m back to where I was originally, and the stripes actually meet and don’t jog. I need to get off the computer and on the road……….. I usually frog a project only if there is a truly noticeable mistake, it’s a gift, wrong size, or the pattern just isn’t working for me. In the case of the Mid-Month Cable Dishcloth, I just don’t care for the pattern. So it’s going to the frog pond and I’ll save the yarn for another dishcloth later on. Started on a hat for Jason (son-in-law) last night. He requested a Dk. gray hat. The one I’m knitting is Dk. gray but will have a few small black stripes for interest. Jessica sent pictures of herself modeling the hat and fingerless mitts I made for her. Hope she doesn’t mind my posting a pic here. The hat and mitts look better on her than when I scanned and posted them in November. 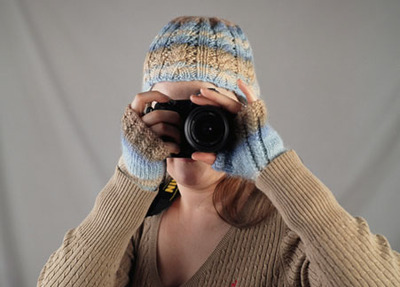 She’s demonstrating how the fingerless mitts keep her hands warm but still let her use the camera. So far we haven’t gotten any of the predicted snow. It’s just raining and turning everything to slush. Tonight when the temperatures drop it will all freeze to a nice solid sheet of ice. Just happy I don’t need to go anywhere. Today is definitely a soup day. I’m going to make my version of “Olive Garden’s Zuppa Toscana” – Spicy italian sausage, russet potatoes and cavolo greens in a creamy broth. Except that I substitute kale for the cavolo greens. Hot, fresh from the oven bread sounds good, too. Off to the kitchen I go. Bad Weather’s Coming…Get Your Office Supplies! I know that when bad weather is coming, people stock up on groceries and deicing items. But, Office Supplies??? Yesterday while we were out getting O2 tanks refilled, yarn and knitting needles. You know, the things you need when you are housebound for a few days. We stopped by Office Max, I needed hanging file folders to finish sorting out the sewing room. The place was packed. There were 5 registers open and people waiting in line. Is this something new, that I didn’t know about? 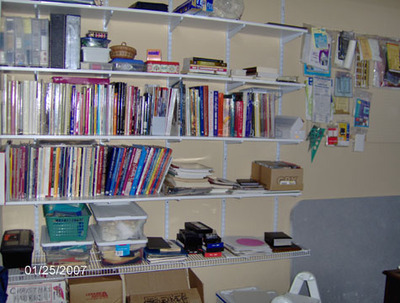 You need office supplies to survive a winter storm? I hope we live throught it, I forgot to buy sheet protectors. 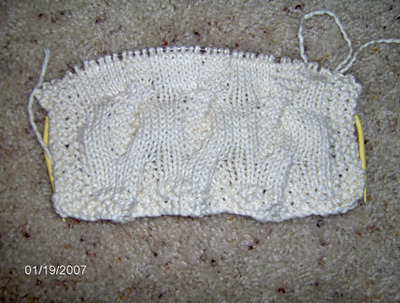 Mid-Month Dishcloth KAL – Day 3 progress. This will definitely need blocking when it’s finished. The Chain Link socks are coming along nicely. I’m getting ready to start the heel flap. But I noticed a mistake in the 5th chain from the top. It has 3 rows of the MC inside the chain instead of 2. Doesn’t show that much and I’m not going to frog back and fix it. So I will just make sure to do the same on the second sock.